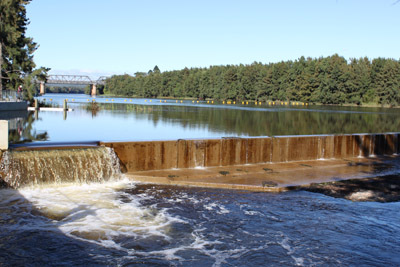 In 2010 WaterNSW oversaw upgrades to 10 weirs along the Hawkesbury-Nepean River. Two water supply diversion weirs - Broughtons Pass and Pheasants Nest - are managed by WaterNSW and they are located near Wilton and Appin. These weirs were constructed in 1888 on the Cataract and Nepean rivers as part of the Upper Nepean Scheme with water then transported via the Upper Canal for 64 kilometres to Prospect Reservoir. Today, the weirs remain an integral part of the water supply system. With the four Upper Nepean Dams - Cataract, Cordeaux, Avon and Nepean - built between 1902 and 1935 greatly expanding the Upper Nepean Scheme. Environmental flows also pass from these dams and over Broughtons Pass and Pheasants Nest weirs. WaterNSW is committed to restoring the health of waterways downstream of its water storages by providing environmental flows. To support this, WaterNSW oversaw upgrades to 10 weirs along the Hawkesbury-Nepean River in readiness for environmental flows from Cataract, Cordeaux, Avon and Nepean dams that began in 2010. Over the past 100 years, these local weirs were installed at various points along the river to provide irrigation water for local industry and still continue to be used today. The upgrades aimed to ensure environmental flows could make it all the way downstream without the weirs acting like barriers to the flows. The works undertaken in 2009 included installing environmental release outlets on eight weirs and installing or replacing fishways on 10 weirs. The works were part of the NSW Government's $33 million program to allow for new environmental flows and improve fish passage in the river.